To help the client team moving forward I’ve produced a home page blueprint for the website built during Full Code Press. With web projects requiring information architecture and overall user experience input it’s often as useful to justify the strategy and principles behind recommended approaches as it is to implement them. Rainbow Youth helped us to understand their audience, now they need to pick up the website and run with it. It’s important they understand the strategy behind the home page and the function each element performs in relation audience motivations and expectations. Since the Full Code Press event the Codeblacks team are providing tweaks and ongoing direction for our client, Rainbow Youth before the new site goes live. 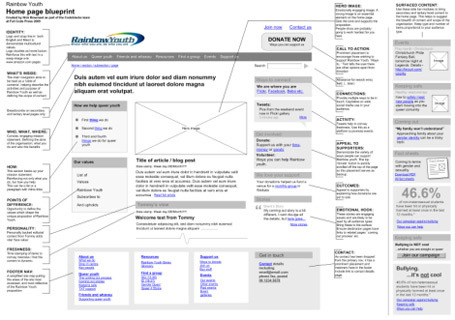 To Share the goodness and our findings, …I have made a copy of the web page IA-UX blueprint available for those who work with the design of charity websites. This entry was posted in Code Blacks, Design, Full Code Press, User Experience, UX methods by Nick. Thanks for your comment and I’m pleased it’s useful. Some of the thinking here is bespoke, but a lot of it is generic and could be applied to other charity websites. Actually, when it comes to universally useful findings, We referred to a Nielsen Norman report which identified the most important item on a charity home page to be ‘What do you do?’ .. From my experience the majority of websites could do with considering this. In my research I’ve found that it’s important to not only show “what you do”, but also “who you are”, as the public’s perceptions of people behind the service can often hinder them from using the service (I recently worked on a charity site where a number of users thought the people behind the service were the police, which presented a barrier for them to contact the service). Also, I really like this example of presenting strategy along with wireframes/schematics, in a clear and simple way as you’ve done. Well done for winning Full Code Press 2009!